Punch it up at your next party with an all-rounder punch recipe to entertain the masses. Punch is as versatile as the ingredients used to make it. There are summer punch recipes, Christmas punch recipes, sophisticated punch recipes and mocktail punch recipes. We’ve chosen an easy drinking punch recipe using fresh fruit and spirits you’re likely to already have in your drinks cupboard or, if not, are easily attainable. A mixed drink, usually made in large batches rather than a single glass, comprising any variety of alcoholic or non-alcoholic ingredients. Originally concocted by sailors of the British East India Company, punch made its way from The Colonies (specifically India) to Britain and the Americas in the 1600s. Original punch recipes used rum, sugar, water, citrus and spices; five ingredients after which punch was named (punch meaning five in Sanskrit). Ah well, that’s impossible to say as it all depends upon the punch recipe you’re using. If you’re catering for a crowd you’ll need to triple or even quadruple the recipe. And to ensure that your large batch stays chilled without becoming watery, serve in a punch bowl (or big jug) set within a larger bowl of crushed ice. 1. Line a baking tray with non-stick baking paper. Cut half the watermelon into smallish chunks. Place, in a single layer, on the tray and freeze for 1 hour (or until frozen). 2. Coarsely chop the remaining watermelon. Blend in a blender until smooth. Strain the watermelon puree through a fine sieve into a jug, gently pressing with the back of a spoon. Discard any solids. Place the watermelon juice in the fridge to chill. 3. Stir the sugar and lemon juice in a punch bowl or large serving jug until the sugar dissolves. Stir in the watermelon juice, ginger ale, vodka and wine until well combined. 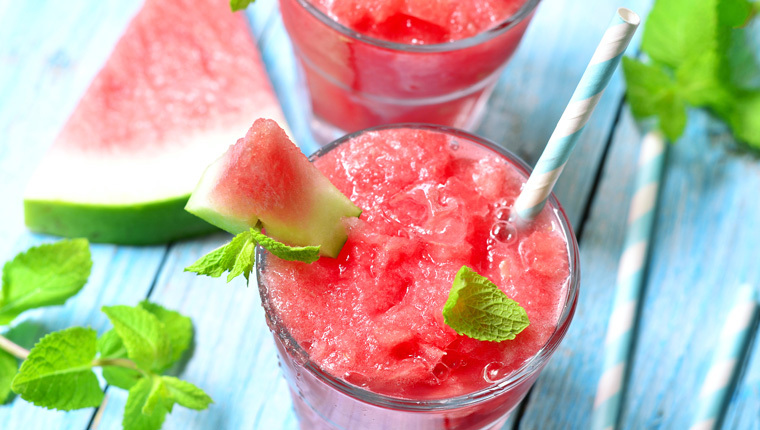 Stir in the mint and frozen watermelon pieces.